Before I start just a quick reminder that the Origins Of The Afro Comb Exhibition closes this week, on Sunday! Those of you who've been to the exhibition are probably already familiar with Author Kandace Chimbri. She was also a member of the committee for Origins Of The Afro comb. She wrote and published the children's book The Secrets Of The Afro Comb, to coincide with the exhibition. I will be writing a full review of this book as it's absolutely excellent and definitely not just for children. 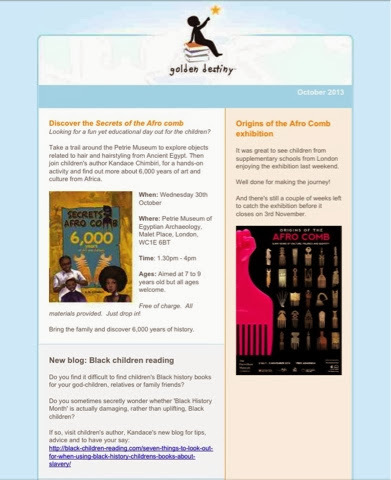 On the off-chance that you're free tomorrow and looking for something fun and educational to do for half-term, I would definitely recommend visiting the Petrie Museum in London, between 1pm and 4pm, where the Author Kandace will be holding some hands on activities for children, and teaching a bit more about the origins of the Afro comb. I need a whole other blog post to tell you how much I love the book. Any of my friends who have children, will be getting a copy. If you're free tomorrow I'm sure it will be on sale, so go and get a signed copy while you can. Tell 'em Crystal sent you! Ages: Aimed at 7 to 9 years old but all ages welcome.